They summoned me to the dispatch center with a promise of being introduced to a relative of the Duck of Justice. Since I was the individual who retrieved our mascot from a trash receptacle after he was tossed into the can by an angry German girl, I was unaware of any local family ties. What you now observe in the photos provided with this early morning missive is exactly what I saw upon my arrival. 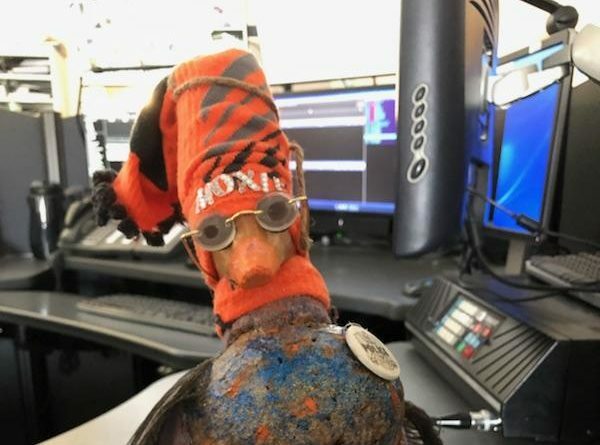 Dispatcher Katie Oakley claims that Moxie is the brother to the Duck (BTTD). Katie’s claim is that Moxie is the Duck’s “stoner” brother who has spent his life being a little more free with his time, drinking Moxie and skiing. I have no way to validate or disprove her claim. Now, before anyone gets all up in my grill regarding the use of the word stoner, I am only relaying to you what I have been told by Katie. Oh, and Katie’s Aunt Janet. She’s from Nebraska. Janet Knipe, who is the creative genius behind Moxie also claims that the DOJ provided the shirt which Moxie wears. It doesn’t look exactly like one of ours, but again, it’s hard to question someone with the impeccable Nebraska street cred of THE Janet Knipe. I remain partially convinced of that there is a shred of truth in some of this, but not all. I asked Katie, an incredible communications specialist, to pose with the Duck. She was willing. Katie is also from Nebraska. The can of Moxie is a nice touch, and the sunglasses are an on-point accessory. Aunt Janet also makes gnomes and other Bohemian-“flavored” decorative knick-knacks. I have no proof of my personal opinion or theories, but I suspect that somewhere, in-between the straight as an arrow rows of corn, nestled within that fertile Nebraska soil- Aunt Janet might just might be growing a little something of her own. Moxie is a welcome addition to a room where our professional information gatherers spend upwards of 16 hours a day. There needs to be some nonsensical stress relief given to these saviours of the sad, injured and hurting folks who hit those three digits with full expectation that they will be well cared for, and listened to, at the most inopportune times in their lives. We will be here. Call if you need us.